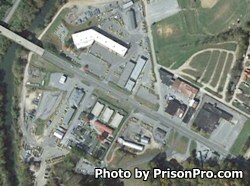 Wilkes Correctional Center is located in North Wilkesboro North Carolina. It is a minimum custody prison that houses 262 adult males. Inmates at Wilkes Correctional Center can take academic courses to earn a GED and vocational classes to learn computers, and life skills. Additional programs for substance abuse treatment and drug and alcohol abuse education are also available to inmates. Offenders at this facility are housed in dormitories. Wilkes Correctional Center allows inmates to work in a variety of jobs both on and off institutional grounds. Some of the on site jobs include food services and custodial and building maintenance. Off site jobs include community work squads and road crews. Additionally, inmates who are close to parole or nearing the end of their sentence may qualify for the work release program which allows the inmate to report to a job in the surrounding community during the day and return to the prison at the end of their shift. The visiting schedule at Wilkes Correctional Center is based on the first letter of the inmate's last name and rotates every four months. Visits occur on Saturdays and Sundays from 1pm-3pm, but the day the inmate is allowed will depend on the first letter of their last name. Contact the correctional center for the current visiting rotation. Inmates are limited to a maximum of three visitors per session.